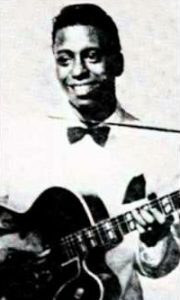 Heading into 1949 there was no indication that there’d be anyone fitting Lonnie Lyons’ description making a name for himself in rock. He’d never recorded before, seemed to be on nobody’s radar outside of the club scene in Houston, and even now, looking back from the Twenty-First Century, there’s no prominent mention of him anywhere in rock history. He scored no hits of his own in his brief career, played on very few behind others (and none too memorable at that) and there not even any pictures of him to be found. So imagine our surprise when Lonnie Lyons started making a case for himself to be more prominently included in rock ‘n’ roll’s long winding story after a newly formed Houston-based label, Freedom Records, came into being this past March and enlisted Lyons to help hold down the fort in the studio band, then found those anonymous musicians were capable of much, much more. These are the kind of discoveries that make musical archaeology so rewarding. More often than not digging through rock’s attic and scouring the musty corners of its basement winds up with you covered in cobwebs and holding a few mildew tainted records that either everybody already knows or few people WANT to know. The hope here though was that by airing it all out again a new generation – that would be those of us coming of age this century – could make new appraisals of the long forgotten work of last century and if nothing else at least start to properly credit all of those who plied their trade in the field of rock ‘n’ roll. Whether the records themselves were good, bad or indifferent at least the names of the artists who created this wonderfully disparate noise could be logged into the history books with permanent ink, their efforts duly noted. However when you come across an unfamiliar name such as Lonnie Lyons and start doing the requisite historical research you’ll find out next to nothing outside of the fact he died young just a few years later and that’s when most would probably move on to the next name, one with a little more verifiable evidence of his existence and hopefully with some more familiar records to entice readers into sticking around. That kind of reaction could hardly be blamed since we have tens of thousands of artists still to get to in rock’s story. But that response, understandable though it may be, would only compound the indignities Lyons had already faced in life, making his dismissal here as well something of a posthumous coup de grâce. He deserves better than that. We all do. 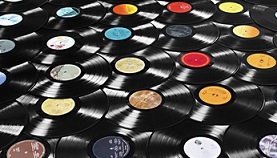 So here we are, reviewing records that nobody bought, nobody heard and nobody in the seven decades since have cared about or probably were even aware of to begin with. The thing about it is though, these records involving Lonnie Lyons which were little more than afterthoughts, probably at the time and certainly in the years to follow, have turned up a multitude of surprises, almost all of them good. Whether backing Goree Carter on Rock Awhile, one of the best rock records to date, where they were dubbed The Hep Cats (a wonderfully evocative name for such an outfit) or transforming country bluesman L. C. Williams into a more than serviceable rocker, these guys – which included leader Conrad Johnson on alto sax, Sam Williams on tenor, a rhythm section of Nunu Pitts on bass and Allison Tucker on drums, plus guitarist Carter himself joining them alongside Lyons on piano – were never anything less than stellar in their work. Starting last month with the wonderfully named Flychick Bounce, that work also included the unlikely sides credited to Lyons himself who unpredictably showed he was a capable, though hardly extraordinarily gifted, singer as well. Now here he is again on Neat And Sweet, eschewing vocals for something a lot more predictable in terms of the kind of output you’d expect from a studio band, but hardly predictable when pulling back the layers to hear what lays inside. You wonder what the circumstances were surrounding the Lyons sessions. Were they using leftover studio time to lay down their own sides after backing someone else or were they the focus of the day’s recording? On Neat And Sweet it definitely sounds as if it were the former, as an alternate title to this could’ve been Simple And Basic if only that had rhymed. But that’s not so much an insult as it is a description of its approach. Lots of worthwhile endeavors are simple and this song is no exception. 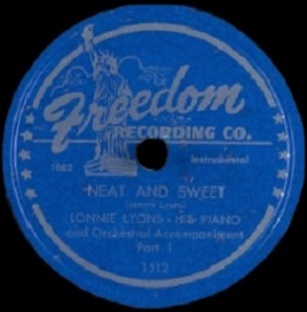 Lyons is playing a… well, let’s call it what it is… he’s playing a basic progression that is designed to lull you into a drowsy acquiescence, his left hand keeping the rhythm inching forward while his right adds the embellishments that give it a bit of a New Orleans feel at first. It’s almost a minute into the proceedings before another instrument makes its first appearance and so any thought that this was going to be a full band blowout has probably left your mind. You might sigh with resignation, having hoped for something a little more complex and exciting, but that’s the risk of diving into each and every side you dig up, there’s bound to be a few that fail to live up to your expectations. But the saxophone’s presence adds another layer to this, one that fits in nicely with the typical rock instrumental vibe over the past year or so. Sam Williams is playing a lazy melodic line, keeping with the overall motif. It’s becoming quite obvious that the song is certainly not designed to be a show-stopper by any means, but rather a transitional piece for a long night on the bandstand somewhere. A song that many in the audience will probably be ordering their next round over, chatting up the bartender or, depending on how many drinks the guy has had already, maybe make a pass at the single lady at the end of the bar who is too pretty to be alone but juuuuuuuust approachable enough to make casual conversation with, all while knowing it’s going nowhere. In other words it’s a backdrop song at this point. A very serviceable one for the time, one appropriate for the types of joints where a band like this would be playing on a Saturday night. If you’re the lady at the end of the bar Neat And Sweet is something that will keep you occupied enough to not nervously eye each and every would-be Lothario, worried about them all lining up to crassly hit on you. Or if you prefer, the song is something that will distract you from the fact you haven’t been hit on yet if you’re the kind of gal who goes to bars looking to boost your self-esteem by flaunting your wares and tallying up your appeal by the number of drinks get bought for you by horny desperate men. 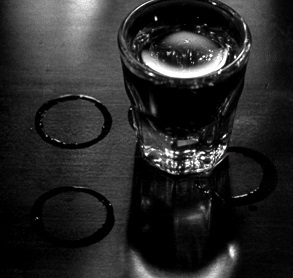 For the guy at the opposite end of the bar still nursing his own drink while working up the courage to amble down to say hello to her, this song will pass the time nicely, taking your mind off the fact that you spotted her fifteen minutes ago and haven’t moved a muscle yet and the longer you wait the more obvious your indecision will be when your feet finally do hit the floor. But just as you’ve let the pleasant aura it’s creating envelop you, giving you the sense that you might actually have all night to get off that bar stool after all, along comes something to snap you back into reality in the form of Goree Carter’s sudden appearance on guitar. Now time speeds up and you’re back on edge. We’ve already stated that The Hep-Cats, as we’ll respectfully continue to call these guys, were the best self-contained rock band of the 1940’s. Not that there’s much competition in that regard, but even if there was they’d be a formidable bunch to try and unseat from that position. But within that larger ensemble were individual musicians who we can also make some pretty definitive assessments of in terms of their positioning in the rock world. Lyons of course is no slouch on his instrument of choice, whether laying down some grooving uptempo boogies in the past and now turning around and providing something a little more methodical. He’s got a firm grasp on technique and plays with a genial confidence that’s very appealing. The rhythm section is rock solid in every way and the saxophonists, Conrad Johnson on alto joining Williams on tenor, have both shown their chops are first rate as well. While neither will vie with the likes of Big Jay McNeely, Earl Bostic or Maxwell Davis, they more than hold their own in the company of most other mortals in rock during this period. Yet towering above them all is Goree Carter. He is not only unquestionably the best guitarist in rock music of the late 1940’s, but he’s in the discussion for the greatest musician on any instrument during these initial years and so a chance to hear more of him in whatever form presents itself is an entirely welcome occasion. On Neat And Sweet he lets the gradual ramping up of the sax solo’s intensity lead into his own unveiling. There was no way to be sure he was even present on this record when it started and so when he steps out from behind the curtain so to speak it has something of a transformative effect. Not only does the song get a surge of electricity, literally as well as figuratively, but it alters the entire mood from sounding laid back to being supercharged. His harsh chording that kicks it off acts as the alarm bell ringing in your ears that gets your head off the pillow before he abruptly shifts into a slow, almost sensuous feel, teasing you with drawn out notes, then stinging you repeatedly with quick bursts that offset the intentionally repetitive bassline carried out by Lyons in metronome-like fashion. Over the next twenty years, right up to the late 1960’s when studio effects became more prominent as did longer and louder solos, Goree Carter would’ve been at home in most any rock style that came along. His playing is vibrant, his judgment exquisite and he commands your attention in ways that never overshadow the rest of a song’s arrangement. In just under a minute in the spotlight he adds so much flavor to this, so many colors, that when Lyons piano returns to take over the lead for the final run of Part One it’s anti-climatic, even if it is appropriate for the type of record this is. Ever since Sonny Thompson hit big with Long Gone more than a year ago the seed was planted in everybody’s mind – musicians, record labels and customers alike – that when it came to grooving instrumentals why stop at one when you can offer two on the same record? So, using that song as the model, Lyons and crew break this into two parts and rather surprisingly don’t manage to repeat themselves at all. In fact what was showcased so effectively on Part One largely is absent from Part Two, which comes as something of a let down for those looking forward to a dramatic reappearance from Goree Carter. But instead this half is given over almost entirely to the horns, which is really no surprise considering how dominant saxophones were in 1940’s rock. But it’s not the saxes, at least at first, which take center stage, but rather Nelson Mills on trumpet. I know, that’s usually a sign to start fleeing for the exits, but after a prolonged group horn refrain conjuring up a train pulling out of the station, Mills gives us a late night wistful solo which adds to the increasingly haunting mood this is suggesting. Sam Williams and Conrad Johnson each take turns on their respective saxophones, neither ramping things up as we might’ve hoped, but not putting a damper on things either. Both play with a smokey feel before Lyons steps back in to take it back to that circular train riff as it closes things out. Clearly they were determined to show off each band member in turn and while that can take on an awkward artificial air in lesser hands, they pull it off well. Each part leads smoothly into the next and about all this is lacking are standalone spots for the bassist and drummer. While Part Two is less riveting than Part One, thanks to the total absence of Carter (even in the background), the effectiveness of the group’s interplay is still apparent and as mood enhancers after midnight go, this works just fine. So you’re probably thinking this is going to wind up with yet another big green number, firmly establishing these guys as not just the pre-eminent band in rock, but maybe the most likely to emerge as stars in the rock orbit. No, that’s not the case even though what they set out to do here they accomplished with relative ease. The problem isn’t that Neat And Sweet doesn’t live up to the band’s intent, but rather the intent is largely what we described early on. It’s a mood piece… instrumental filler for a long night on the bandstand. That it contains some notable surprises in its midst thanks to Carter’s presence in its tight arrangement doesn’t change the fact that it’s not otherwise trying to do much more than keep the patrons from heading down the street to the next club when they take some air – or considering it’s 1949 when everybody smoked 20 cigarettes a day, to fill the outside air with noxious fumes. Those who did step outside will still be able to hear this playing through the open doors and it’ll keep them tethered to the immediate vicinity, but while Carter’s arrival might get a few of them to rush back inside to catch his unexpected mid-song act, it’s still not going to wind up being a song you immediately rush up to request again, apologizing profusely for missing half of it by stepping out in the first place. Every quality band at the time had something like this in its repertoire and while these guys pull it off with more panache than most could, or would, attempt it didn’t try to redefine that role and reconfigure the entire prototype, Carter’s performance non-withstanding. Neat And Sweet comes across better breaking it down piece by piece as we do here for all records than it would if it were simply the song being played as you slid off that bar stool when you saw the single lady do the same, plotting intricately to cross paths with her on the way to the restrooms. The best songs though, better ones by this same band no less, would have you forgetting the lady altogether along with the need to relieve yourself of your last three drinks as well as making you forsake your soon to be fatal nicotine habit just so you could immerse yourself further in its sound. 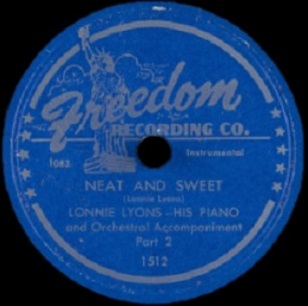 Leave a reply on "Lonnie Lyons: “Neat And Sweet”"